Lone Ranger Is A very good action driven film for most everyone. Galloping onto Blu-ray, the western The Lone Ranger takes center stage in your home theater just in time for holiday giving. The action packed thriller fills the whole house with excitement and adventure. The film is exciting and the bonus features are a plus, plus with over 45 minutes of extras. The release is available in several formats including a Blu-ray/DVD combo pack + Digital Copy. Taking a chance on an old-time favorite, producer and director Gore Verbinski brings a remake of The Lone Ranger to the big screen. Loosely based on the 1956 movie and subsequent TV shows starring Clayton Moore and Jay Silverheels, his casting of Armie Hammer and Johnny Depp somewhat mirrors the two original players and delivers a solid hit. The film opens at a traveling carnival with a young boy dressed as Lone Ranger walking into a sideshow featuring memorabilia of the old west. When he comes to one particular exhibit there's a statue of a very old Indian. Watching it for a long time, all of a sudden the statue comes to life and calls the boy Kemo Sabe. So starts the narration of the movie of The Lone Ranger by his sidekick Tonto. Flash back to the 1930's and we find John Reid (Armie Hammer) arriving in the old west on a train that's being hijacked by a gang to free their captured boss notorious killer Butch Cavendish (William Fichtner). After a terrifying ride into danger Reid gets out alive and meets up with his brother U.S. Marshall Dan (James Badge Dale) just in time to join the posse that's set out to get Cavendish. In their pursuit they meet with disaster and John Reid finds himself being thrown into graves along with the other men in the group. When a rogue Indian named Tonto (Johnny Depp) from the area's Comanche tribe comes across Reid's body and finds that he's still alive he revives him and starts up a friendship that will lead to Reid becoming Lone Ranger. I like the way Gore Verbinski handles the story with a dark side to his hero. He keeps his actors on a tight leash doing the best he can to keep them in character. It's not easy to keep Depp from taking a few liberties with his facial expressions and Verbinski uses them to good measure. While Hammer handles most of the dialogue, I found that Depp carries most of the movie getting Lone Ranger in and out of danger. Verbinski uses some well choreographed scenes much like he did in Pirates of the Caribbean to bring on a lot of wild action from swinging onto trains to busting through windows. Once the action starts he hardly ever puts on the brakes. Just for laughs I went on line to view The Lone Ranger movie that was released in 1956 that starred Clayton Moore as Lone Ranger and Jay Silverheels as Tonto. I'm amazed on how similar Moore and Hammer look and if not for the wild face paint on Depp his character has a similar swagger to Silverheels. The story gets different however, in that one deals with a rancher trying to get a mountain of silver and here it's a ruthless killer trying to do the same, both aggravating the Indians to help their means to an end. Co-producer Jerry Bruckheimer fuels the story by providing locations, excellent cinematography, outstanding make-up special effects crew, huge sets, stunt pros, special props and actual trains much like he did with the ships and sets in Pirates of the Caribbean to make the film action and adventure filled. With Hans Zimmer at the helm of the musical score nothing has been left to chance for a rousing production and he delivers. I especially like the playing of the William Tell Overture that's an integral part of the original television and film releases. Being Zimmer, I even detected a scene that had music very similar to Pirates of the Caribbean and made me wonder if he wanted to leave an imprint reminder in this film. The bonus features are very good and add a lot of information to the making of this western classic. "Riding The Rails Of The Lone Ranger" Here we are treated to the making of the railroad scene that's such an integral part of the story. They actually built the trains for the movie and laid 5 miles of tracks to shoot the film. It's a fun ride seeing how it was all put together to make this incredible opening action sequence work. Some of the stunt work is crazy and includes the stars doing their own scenes. "Armies's Western Road Trip" this special feature is lead by Armie Hammer and Jerry Bruckheimer as they show the locations where the film was shot including New Mexico, Colorado and the Grand Canyon. "Becoming A Cowboy" shows how the stars were taken to a cowboy boot camp working on shooting guns, riding horses and roping Armie Hammer (The Lone Ranger) takes viewers on a tour of the scenic locations the production shot in as we see and learn more about the amazing places he went to become The Lone Ranger. There's also a funny "Blooper Reel" and Deleted Scenes. The widescreen presentation played on a 16x9 television is very dynamic with the 1080p HD in the Blu-ray format. The aspect ratio of 2.40:1 doesn't bother too much as it assures the same showing as it's made for the big screen. Nothing is cut off, the colors are awesome and the high quality picture amazing. Depending on your TV, you should enjoy every breathtaking moment of the action packed film. The sound quality stands up to the best in Blu-ray and DVD. The special effects played using the 7.1 DTS-HD Master Audio are spectacular and the dialogue crystal clear. If you have surround on your television or upgraded sound bar you'll even get a better presentation of all the action including some awesome fighting on top of the locomotives. The Lone Ranger has been rated PG-13 by the MPAA for sequences of intense action and violence, and some suggestive material. While the film has a strong link to teens, it's definitely a very good show for adults so don't get mislead by its rating. All three of the Pirates of the Caribbean had the same rating and this has the same no age boundary. 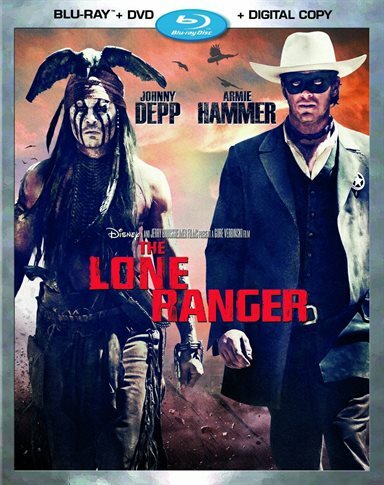 Download The Lone Ranger from the iTunes Store in Digial HD. For more information about The Lone Ranger visit the FlickDirect Movie Database.